The events in Charlottesville last weekend around a planned white nationalist protest called “Unite the Right” have raised the ugly specter of racism again in a country which has been steadily growing ever more diverse. Given that white evangelical Christians famously voted in droves for the same president that the white nationalists cite as inspiration, one naturally wonders: Should we be also allow ourselves to be united to such a cause? The answer, for Christians who follow Jesus, is a resounding no. To be quite honest, even as a Christian, I didn’t always realize this. For much of my life, I would say that I probably had a general impression that the Bible was against slavery or hatred of any kind, and that racism was not specifically called out. It wasn’t until I read John Piper’s Bloodlines as a part of a book study at my church earlier this year that I became aware of this thread of messages woven throughout the gospels. Accordingly, then, much of the credit for this post comes from that book, particularly chapter 7, which I’d highly recommend if you want to dive into this in more detail. I’ll be focusing just on Jesus’s words and deeds as recorded in the gospels, but Piper deals very thoroughly with how the rest of the Bible and Christian theology also condemn racism, answering all of the tangential questions that might arise along the way. For the purposes of this blog post, I’ll also focus on only one component of racism, called ethnocentrism, the belief that one’s own ethnic culture is superior and/or favored by God. This seems to be the opinion of white nationalists who want the United States to be an “ethnostate,” chanting slogans like “You will not replace us!” But while that’s the most obvious exhibition of these sentiments this week, I don’t expect this is an opinion unique to white people. To sum up, Jesus first claims to be the Messiah, and they admire him. Then he explains that his message and healing are meant for foreigners, and they want to kill him. He shares this message by bringing up two stories from prophets in the Old Testament showing that God repeatedly chooses to lift up and act through the ethnic and political foreigner. Why bring this up in his hometown? Well, they were probably expecting some kickback, some special status as the ancestral home of the Messiah. But Jesus’s kingdom is not embedded or constrained by the ethnic and geographical landscape of the day, then or now. His message and calling is universal, and even goes out of the way to include those of different races and nations. But it doesn’t stop there. Jesus goes on to heal a Roman centurion’s servant (Matthew 8:5-13) — keep in mind that the Romans were the mortal enemies of the Jews — and a Syrophoenician’s daughter (Mark 7:26). When he wants to illustrate for his audience what loving your neighbor looks like, he picks a Samaritan as his hero (the Parable of the Good Samaritan, Luke 10:25-37). What makes Jesus angry? In Mark 11:15-19, he sees merchants ripping off foreigners in the outer court of the temple: “And he was teaching and saying to them, ‘Is it not written, “My house will be called a house of prayer for all the nations”? But you have made it a den of robbers. '” This outer court wasn’t even meant for the Jews; it was for foreigners. The idea of denying or even slightly inhibiting a foreigner’s access to God is revolting to Jesus. At his final address to his disciples, Jesus gives them this mission: “Go therefore and make disciples of all nations, baptizing them in the name of the Father and of the Son and of the Holy Spirit, teaching them to observe all that I have commanded you. And behold, I am with you always, to the end of the age.” (Matthew 28:19-20, ESV). His final words carry forward what had been his mission all along, that the Christianity that he founded would not be confined to or bestow benefits on any one ethnic or political population. When I first realized this upon reading this chapter (and the rest of the book), it surprised me. Explicitly baked into Christianity from the beginning is a conviction that ethnic and political barriers are wrong. This is why you see Christians fervently trying to evangelize in the far corners of the earth. 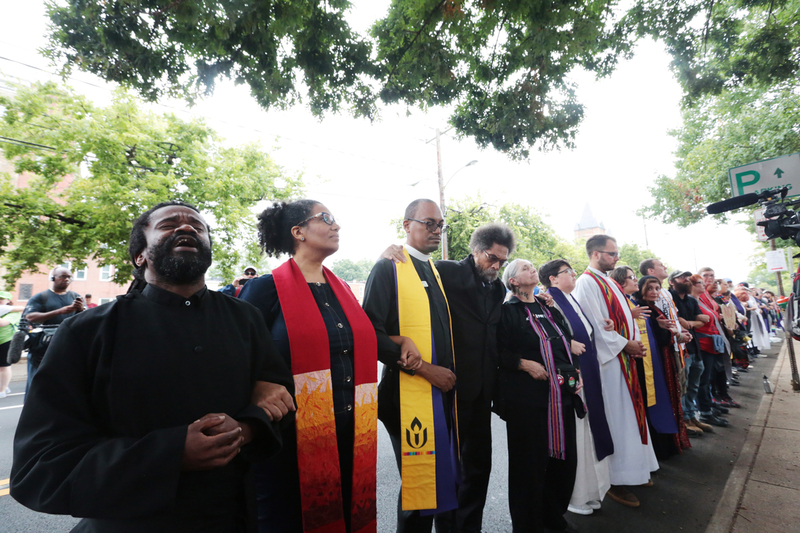 It’s why Christians have been on the front lines of ending slavery (Abraham Lincoln, William Wilberforce) and racial reconciliation, and why there were clergy counter-protesting in Charlottesville, and why evangelical leaders have nearly universally condemned the rally. Image credit: Heather Wilson, as featured here. Christians, there are some political matters where there is room for debate about the best way for us to respond to the calling of Christ. As a centrist, I actually think this is true for most issues where there is substantive disagreement between the two parties. But ethnocentrism, most prominently expressed today in white nationalism, is not one of those issues. Jesus and the rest of the authority of Scripture are clear: You cannot be ethnocentric and a follower of Christ at the same time. Sadly, the white supremacists who identify as Christians also read their Bible to understand that the same God who forbade race mixing in the Old Testament never changed his Law in the New Testament. They see an overall story of separation of race, of status, of gender – and few Christians are prepared to deny the words of the Bible – flawed and misinterpreted as they are. Now we’re standing at a crossroads in the church, where racism and sexism meet – we can read verses that hearken back to an ancient society and wonder what direction God means for us to go in this day and age. Great question! This notion of God being against interracial marriage is, to put it mildly, a blatant misreading of Scripture, as exhaustively spelled out in Chapter 15 of Bloodlines. Let me summarize. In the Old Testament, God never forbids interracial marriage, only interfaith marriage. The distinction is clearest with the example of Ruth, a Moabite who converts and marries an Israelite, Boaz, in a union that is celebrated and along the ancestry of David and Jesus — Ruth is one of only four women listed in that lineage. In reality, the restrictions they cite are never about race, only faith. Here’s Deuteronomy 7:3-4, often quoted in this context: “You shall not intermarry with them, giving your daughters to their sons or taking their daughters for your sons, for they would turn away your sons from following me, to serve other gods. Then the anger of the Lord would be kindled against you.” As you can see, the major concern with intermarriage is protecting religious purity, not racial purity. Sam Elder – thank you for this article. It’s very well written and illustrates something I never realized before in the text that you used. I never caught that the mentioning of the foreigners is what made the people angry at Jesus. Definitely speaks to ethnocentrism. Intriguing! You also see in Scripture too where examples of racial intermarriages (Moses and his Ethiopian wife. Numbers 12) where God addresses the error of the others directly. Another “Bible questions” webpage that I saw addressing the issue of racism, used the passage out of James 2 which addresses setting a person of wealth in favor and a person of poverty in disfavor. The passage says “….you’ve become judges with evil thoughts. And it’s interesting and ironic that those who are ethnocentric racists; where their ideology really takes them is described exactly here in James 2 except on a larger scale. They take the accomplishments of societies and civilizations who have generated great wealth with either resource or technology (or both) and compare them to other societies or civilizations who have not generated great wealth with resources or technology; then say civilization A is genetically superior to civilization B because look at what they’ve accomplished and this other group of people over here haven’t. So in other words, they are taking the rich individual and replacing him with the rich society, when in reality they are still worshiping the god of money and accomplishment. These ethnocentric racists fail to see the process by which societies and civilizations develop in anthropological terms. Humanity is very good at operating under the premise that “necessity is the mother of invention”. All societies and civilizations on this planet have started as hunter / gatherers. Until you get larger populations that rub up against each other, do you see more need for regulation. When you get larger populations in need of a source to referencing regulations, than you start to see written language develop. Societies develop under laws and governmental structures that provide stability. Once the basic needs are met, than societies can begin to advance technologically. At that point, it all becomes about “how to build a better mouse trap”, because the basic needs for communication, transportation and how to store and distribute basic needs for food clothing and shelter are the same regardless if you are talking about a society on the beginning end of the anthropological growth spectrum, or the end. Needless to say, I think a couple of verses in Acts sum it up well.